Gioacchino Antonio Rossini (February 29, 1792 – November 13, 1868) was an Italian musical composer who wrote more than 30 operas as well as sacred music and chamber music. His best known works include Il barbiere di Siviglia (The Barber of Seville), and Guglielmo Tell (William Tell (opera))—the end of the overture is popularly known for being the theme song for The Lone Ranger. 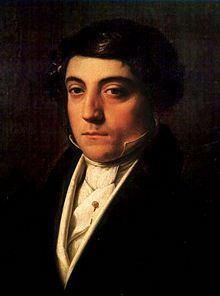 Rossini was born into a family of musicians in Pesaro, a small town on the Adriatic coast of Italy. His father Giuseppe was a horn player and inspector of slaughterhouses, his mother Anna a singer and baker's daughter. Rossini's parents began his musical training early, and by the age of six he was playing the triangle in his father's band. Rossini's father was sympathetic to the French, and welcomed Napoleon I of France's troops when they arrived in Northern Italy. This became a problem when in 1796, the Austrians restored the old regime. Rossini's father was sent to prison and his wife took her son to Bologna, earning her living as lead singer at various theatres of the Romagna region, where she was ultimately joined by her husband. During this time, he was frequently left with his aging grandmother, who was unable to control the boy. He remained in Bologna in the care of a pork butcher, while his father played the horn in the bands of the theatres at which his mother sang. The boy had three years instruction in the harpsichord from Prinetti of Novara, but Prinetti played the scale with two fingers only, combined his musical profession with the liquor business, and fell asleep while he stood, so that his critical pupil ridiculed him. He was taken from Prinetti and apprenticed to a smith. In Angelo Tesei he found a congenial master, and learned to sight-read, to play accompaniments on the piano forte, and to sing well enough to take solo parts in the church when he was ten years of age. At 13, he appeared at the theatre of the Commune in Paër’s Camilla — his only public appearance as a singer (1805). He was also a capable horn player in the footsteps of his father. In 1807, the young Rossini was admitted to the counterpoint class of Padre P. S. Mattei, and soon after to that of Cavedagni for the cello, at the Conservatorio of Bologna. He learned to play the cello with ease, but the pedantic severity of Mattei's views on counterpoint only drove the youngster toward a freer school of composition. His insight into orchestral resources is generally ascribed to knowledge gained independently while scoring the quartets and symphonies of Joseph Haydn and Wolfgang Amadeus Mozart. At Bologna he was known as "il Tedeschino" ("the Little German") on account of his devotion to Mozart. Through the friendly interposition of the Marquis Cavalli, his first opera, La Cambiale di Matrimonio, was produced at Venice when he was a youth of 18. Two years earlier, he had received the prize at the Conservatorio of Bologna for his cantata Il pianto d'Armonia sulla morte d’Orfeo. 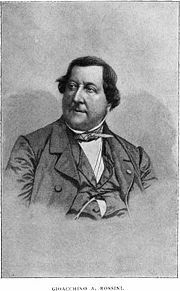 Between 1810 and 1813, at Bologna, Rome, Venice, and Milan, Rossini produced operas of varying success. All memory of these works is eclipsed by the enormous success of his opera Tancredi. The libretto was an arrangement of Voltaire’s tragedy by A. Rossi. Traces of Paër and Giovanni Paisiello were undeniably present in parts of the music. Appreciation of such melodies as "Di tanti palpiti...Mi rivedrai, ti rivedrò," became so popular that Italians would sing it in crowds at the law courts, until called upon by the judge to desist. Rossini continued to write operas for Venice and Milan during the next few years, but their reception was tame after the success of Tancredi. In 1815, he retired to his home at Bologna, where Barbaja, the impresario of the Naples theatre, concluded an agreement with him by which he was to take the musical direction of both the Teatro San Carlo and the Teatro Del Fondo at Naples, composing for each of them one opera a year. His payment was to be 200 ducats per month. In addition, he was to receive a share of Barbaja's other business, popular gaming-tables, amounting to about 1000 ducats annually. This was an amazingly lucrative arrangement for any professional musician at that time. Some older composers in Naples, notably Nicolo Antonio Zingarelli and Giovanni Paisiello, were inclined to plot against the success of the youthful composer; but hostilities were made futile by the enthusiasm which greeted the performance of his Elisabetta regina d'Inghilterra, in which Isabella Colbran, who subsequently became the composer’s wife, took a leading part. The libretto of this opera by Schmidt, was in many of its incidents an anticipation of Sir Walter Scott’s Kenilworth. The opera was the first in which Rossini wrote the ornaments of the airs instead of leaving them to the fancy of the singers, and also the first in which the "recitativo secco" was replaced by a recitative accompanied by a string quartet. In Il barbiere di Siviglia, produced in the following year in Rome, the libretto, a version of Beaumarchais' Barbier de Seville by Sterbini, was the same as that already used by Giovanni Paisiello in his own Barbiere. This was an opera which had enjoyed European popularity for more than a quarter of a century. Paisiello’s admirers were extremely indignant when this opera was produced, but it was so successful that the fame of Paisiello's opera was transferred to his, with the title of Il barbiere di Siviglia used as an inalienable heritage. Between 1815 and 1823 Rossini produced 20 operas. Of these, Otello formed the climax to his reform of serious opera, and offers a suggestive contrast with the treatment of the same subject, at a similar point of artistic development, by the composer Giuseppe Verdi. In Rossini’s time, the tragic close was so distasteful to the public of Rome that it was necessary to invent a happy conclusion to Otello. Conditions of stage production in 1817 are illustrated by Rossini’s acceptance of the subject of Cinderella for a libretto only on the condition that the supernatural element should be omitted. The opera La Cenerentola was as successful as Barbiere. The absence of a similar precaution in the construction of his Mosè in Egitto led to a disaster in the scene depicting the passage of the Israelites through the Red Sea. When the defects in stage contrivance always raised a laugh, the composer was at length compelled to introduce the chorus "Dal tuo stellato Soglio" to divert attention from the dividing waves. In 1822, four years after the production of this work, Rossini married singer Isabella Colbran. In the same year, he directed his Cenerentola in Vienna, where Zelmira was also performed. After this he returned to Bologna, but an invitation from Prince Metternich to come to Verona, Italy and "assist in the general re-establishment of harmony" was too tempting to be refused. He arrived at the Congress in time for its opening on October 20, 1822. Here he made friends with François-René de Chateaubriand and Dorothea Lieven. In 1823, at the suggestion of the manager of the King’s Theatre, London, he came to England, being much fêted on his way through Paris. In England he was given a generous welcome, which included an introduction to King George IV and the receipt of £7000 after a residence of five months. In 1824, he became musical director of the Théatre Italien in Paris at a salary of £800 per annum, and when the agreement came to an end he was rewarded with the offices of Chief Composer to the King and Inspector-General of Singing in France, to which was attached the same income. At the age of 32, Rossini was able to go into semi-retirement with financial independence. The production of his Guillaume Tell in 1829 brought his career as a writer of opera to a close. The libretto was by Victor Joseph, Etienne de Jouy, and Hippolyte Bis, but their version was revised by Armand Marrast. The music is remarkable for its freedom from the conventions utilized by Rossini in his earlier works, and marks a transitional stage in the history of opera. Though a very good opera, it is rarely heard uncut today, as the original score runs more than four hours in performance. In 1829, he returned to Bologna. His mother had died in 1827, and he was anxious to be with his father. Arrangements for his subsequent return to Paris were upset by the abdication of Charles X of France and the July Revolution of 1830. Rossini, who had been considering the subject of Faust for a new opera, returned, however, to Paris in the November of that year. Six movements of his Stabat Mater were written in 1832 and the rest in 1839, the year of his father's death. The success of the work bears comparison with his achievements in opera, but his comparative silence during the period from 1832 to his death in 1868 makes his biography appear almost like the narrative of two lives — the life of swift triumph, and the long life of seclusion. Here biographers give us pictures in stories of the composer's cynical wit, his speculations in fish culture, his mask of humility and indifference. His first wife died in 1845, and political disturbances in the Romagna area compelled him to leave Bologna in 1847, the year of his second marriage with Olympe Pélissier, who had sat for Horace Vernet for his picture of Judith and Holofernes. After living for a time in Florence, he settled in Paris in 1855, where his house was a centre of artistic society. He died at his country house at Passy on November 13, 1868 and was buried in Père Lachaise Cemetery in Paris, France. In 1887 his remains were moved to the church of Santa Croce in Florence, where they now rest. In Rossini's genre bel canto does not simply mean "beautiful singing." It can be described as the particular art of voice production where the distinctive timbres of the classical Italian school of singing can be achieved. In this, singers acquired a unique ability to develop as outstanding soloists. The unusual timbres and limpid production that they made, together with their messa di voce and coloratura, made their operatic arias internationally famous. The tuition of bel canto was not based on any special theoretical method. The maestri, were themselves expert performers. They instructed their pupils in the way that they had learned, by trial and error and until their pupils were able to achieve the right vocal quality. As they did not make their art explicit, the maestri were suspected of using their method to protect a professional secret. For Renee Flemming (American diva) bel canto represents the culmination of all the elements of great singing. To the sense of line and beauty of tone required bel canto brings extended range and fiery coloratura. It also asks the artist to plumb every emotional depth to flesh out characters that are often loosely drawn. It has real structure and demands the exercise of good taste but within these rules there is an exhilarating and creative freedom. "Mr. Wagner has beautiful moments but bad quarters of an hour." Typical of Rossinis' witicisms. In his compositions, Rossini plagiarized even more freely from himself than from other musicians, and few of his operas are without such admixtures frankly introduced in the form of arias or overtures. A characteristic mannerism in his orchestral scoring earned for him the nickname of "Monsieur Crescendo." "Wait until the evening before opening night. Nothing primes inspiration more than necessity, whether it be the presence of a copyist waiting for your work or the prodding of an impresario tearing his hair. In my time, all the impresarios of Italy were bald at 30. . . . I wrote the overture of Otello in a small room of the Palazzo Barbaja, where the baldest and rudest of directors had shut me in. I wrote the overture of the Gazza Ladra the day before the opening night under the roof of the Scala Theatre, where I had been imprisoned by the director and secured by four stagehands. For the Barbiere, I did better: I did not even compose an overture, I just took one already destined for an opera called Elisabetta. Public was very pleased." His music is associated with the names of the greatest singers in lyrical drama, such as Tamburini, Mario, Rubini, Delle Sedie, Albani, Grisi, Patti and Christina Nilsson. Marietta Alboni was one of his pupils. Shortly after Rossini's death, Giuseppe Verdi suggested that all Italian musicians should assemble a Requiem in honor of the master opera composer and conductor and began the effort by submitting the "Libera me." Until the next year a Requiem for Rossini was compiled; however, this work was never performed at Verdi's lifetime. Helmuth Rilling premiered the complete Messa per Rossini 1988 in Stuttgart. ↑ His first name is usually spelled as Gioacchino but currently the Rossini Foundation uses in its pages five times Gioachino, five times "Rossini," and three times "G. Rossini." In its name, however, the foundation calls itself "Gioacchino Rossini" once (in its name immediately after the name of the composer), "G. Rossini" once, and "Fondazione Rossini" three times, including when giving its address. ↑ The Foundation, fondazionerossini.org. Retrieved February 7, 2008. "Home Page" – Fondazione G. Rossini. "Home Page" – Rossini Opera Festival. "Gioacchino Rossini" – Classic Cat.